Experience the same half-press for focus, full-press to shoot function as your dry-land photography with the AquaTech Elite II 5D4 Underwater Camera Housing. Designed for use with the Canon 5D Mark IV DSLR, the 33' depth-rated housing's electronic shutter controls (one for portrait, one for landscape) provide a sensation similar to the camera's half-press shutter function, allowing the user to easily determine the half-press for focus and full-press for shutter release. The Elite II's other controls are mechanical, providing easy access to important camera functions, and its ergonomic design and side grip afford optimal handling and comfort. The housing's polyurethane body has reinforced quick release clips and tactile controls made of stainless steel, aluminum, and high-strength plastics. All the aluminum parts have been anodized for resistance to corrosion and other wear and tear. 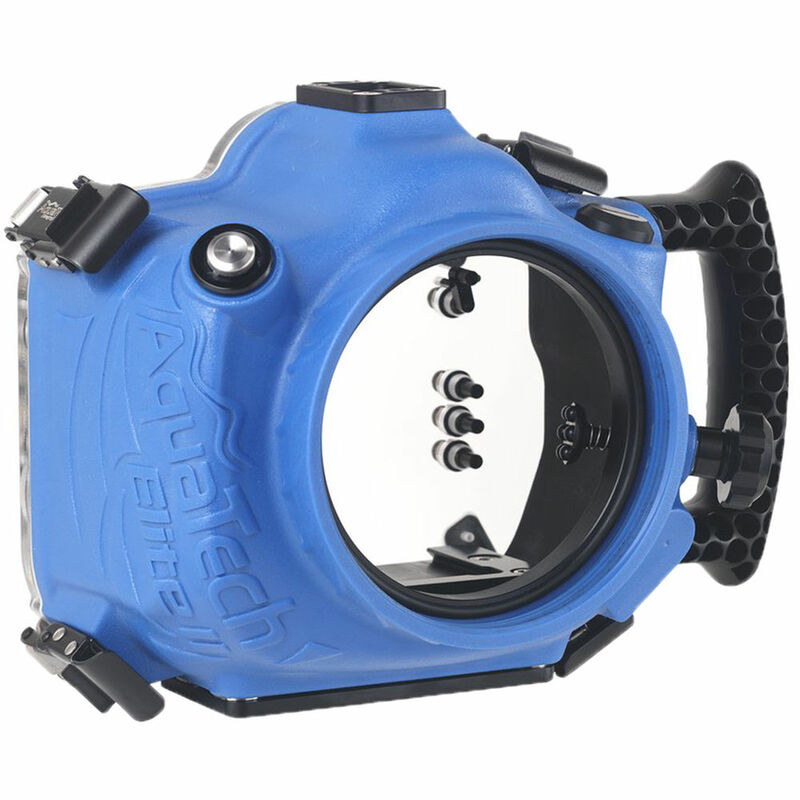 A flash bulkhead sync connector, supplied with AquaTech flash housings, enables the Elite II 5D4 to work with separately available accessories such as external strobe units and pocket wizards. A threaded 1/4"-20 mounting point at the bottom of the housing enables connection to an optional tripod or tray. The enclosure ships without a required lens port and accepts a series of ports for a wide range of lenses. For complete compatibility information, see the Port Chart. Box Dimensions (LxWxH) 10.7 x 8.3 x 6.2"